A view of the Tranquility node in the payload bay of space shuttle Endeavour during the STS-130 crew’s first full day in space on Feb. 9, 2010, a day dedicated to heat shield inspections. Thisstory was updated Feb. 9 at 8:10 a.m. ET. Astronautsaboard the space shuttle Endeavour inspected spacecraft Tuesday to search forany signs of heat shield damage as they head to the International Space Station. Theshuttle blastedoff Monday at 4:14 a.m. EST (0914 GMT) from NASA's Kennedy Space Center inCape Canaveral, Fla. The six-astronaut crew, led by commander George Zamka, isbound for the space station to deliver a new room and spaceobservation deck for the orbiting laboratory. Theheat shield scan is a normal precaution to ensure that the vehicle was not hurtby any foam debris falling from the shuttle's external tank during liftoff.Preliminary video does not indicate cause for concern, mission managers said. NASA'sspaceflight operations chief Bill Gerstenmaier said cameras mounted onEndeavour's fuel tank revealed some instances of foam insulation loss, includingone event about two minutes into the launch in which a larger piece peeledfree, but appeared to miss the spacecraft. "It'sprobably about a quarter-inch thick, maybe about a foot or so long,"Gerstenmaier said. "It didn't appear to impact the orbiter and we see nodamage to the orbiter. It's something similar to what we've seen before." Anotherevent was seen at about the eight-minute mark, he said. Theshuttle's heat shielding helps protect the orbiter from the scorchingtemperatures of re-entry when the vehicle plunges back through Earth'satmosphere to return to the ground. The meticulous scan will help make surethat the insulation is intact and the vehicle is safe to land. 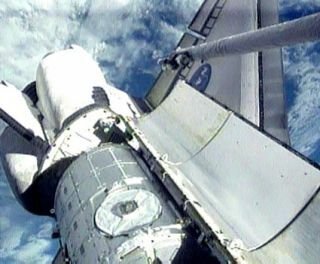 Theinspections have been a standard part of shuttle missions after the loss of theshuttle Columbia and its seven-astronaut crew in 2003. A piece of foam debrisdamaged that orbiter's heat shield during launch, leading to its destructionduring re-entry. Shuttleflight director Kwatsi Alibaruho said that an early look at Endeavour?s heatshield has turned up nothing of note, but more reviews are planned to be sure. Endeavourand its crew are slated to dock at the station on Feb. 10 at 12:09 a.m. EST(0509 GMT). They are planning for a busy 13-day spaceflight, including threespacewalks, to install the new module and observation dome on the orbitaloutpost. Becauseof the timing of the shuttle's launch, Endeavour's STS-130crew will be working the overnight shift and sleeping during the day. Theastronauts awoke late Monday and worked well into the wee hours of Tuesday toperform the inspection using a sensor-tipped inspection pole to sweep thesensitive heat shield panels lining the orbiter's wing edges and nose cap. Missionspecialists Kathryn Hire and Nick Patrick led the scan. "FlightDay 2 inspection is a highly choreographed set of maneuvers with the spaceshuttle?s robot arm holding a long boom and tracing backwards and forwardsalong the leading edges of each wing," Patrick said in a preflightinterview. "It requires a fair amount of diligence because although therobot arm is being flown by the computer, you have to monitor it carefullyenough that you could take over and stop it with a few seconds? notice in caseit goes astray because, of course, the thermal protection system that we?reinspecting is very fragile and we don?t think it would withstand a blow fromthe robot arm." Asimilar scan will be performed near the end of Endeavour'sflight to look for dings from space junk and micrometeorites. Whilesome crewmembers are concentrating on the inspection, the other astronauts willspend their second day in space unpacking materials that had been stowed forliftoff and getting ready to arrive at the space station early Wednesday. ?Sofar, the crew has been doing very well on orbit,? Alibaruho said. ?We?relooking forward to rendezvous and docking. ?